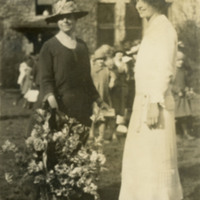 On recto side portrait of Marion Edwards Park, standing behind a large vase of flowers and Ray Strauss on May Day 1923. On verso side portrait of three graduates. Image appears to be cut from scrapbook. Later photo of Marion Edwards Park during the May Pole ceremony. 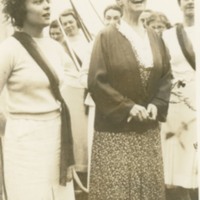 She is laughing and standing next to a woman wearing a sash and a crown of flowers.